What Kinds of Xanax Addiction Treatment Are Available? If you are suffering from an addiction to Xanax or you know someone who is suffering from this type of addiction, Xanax recovery centers can help. Do you want to stay at home throughout your treatment or would you prefer to escape the drug influences around you? Will it work with your lifestyle and responsibilities? Get educated on the different kinds of drug rehab programs so that you can choose one that will best address your individual needs. Who Answers? to speak with a treatment support specialist about what kinds of Xanax recovery programs are available in your area. Xanax addiction treatment cost varies considerably between different types of treatment options. Inpatient vs. outpatient. Inpatient facilities are more expensive due to residency accommodations and 24-hour care. Outpatient treatment is frequently less expensive due to the lack of residential services. 12-step and non-12-step programs are free to attend. Insurance coverage. A great deal of insurance companies offer partial or full treatment coverage. Call your insurance company to ask about its rehab policy. Payment plans. Many treatment centers will work with you on a payment plan that fits your financial situation. Recovering from a Xanax addiction can be very difficult to do alone. Thankfully, many treatment options are available for those suffering from this substance addiction. Inpatient rehab may be the best option for severe Xanax addiction. An inpatient recovery center requires that you live at the facility while undergoing intense treatment. For many people suffering from severe Xanax abuse, an inpatient facility may be the best option due to the high level of care and attention. Many inpatient or residential treatment centers provide access to medical care in addition to ongoing addiction treatment services such as individual therapy and group counseling. Initial assessment. A mental health or other addiction treatment professional will evaluate you for any co-occurring mental health disorders—a situation known as dual diagnosis—as well as assess the severity of your addiction. Xanax detoxification. When necessary, medical professionals will carefully monitor you and administer medications to ease Xanax withdrawal symptoms during detox. Options for length of stay. Treatment program lengths can include 30 days, 60 days and 90 days. Spending more time in a program may help provide a better chance of recovery. Therapy sessions. Individual and group counseling helps you develop coping skills throughout the recovery process. Aftercare. Mental health professionals create a post-rehab follow-up plan for you to maintain a sober life after your stay at an inpatient facility center. Luxury treatment centers are inpatient facilities that offer additional amenities such as recreational activities, hotel-like services and a beautiful location. Executive treatment centers cater to CEOs and people who desire a high level of care while still being able to work and communicate with clients. For those who can’t leave their day-to-day responsibilities, outpatient treatment may be a better option. You are allowed to still live at home while undergoing treatment. Outpatient treatment is not suggested if you are suffering from a severe, long-term Xanax addiction, which may require a more immersive treatment setting. Intensive outpatient treatment. These programs include many of the same services as inpatient programs and meet several times a week. 12-step programs. Participants follow a predetermined set of recovery steps and support each other. Support groups. People struggling with a similar addiction will meet regularly to encourage each other on their journey to recovery. Individual therapy. A therapist meets with you 1-on-1 to explore and work through issues involving your addiction. Group counseling. Similar to individual counseling, except your share your experiences with a group and give feedback to others as they recover. Narcotics Anonymous (NA) is a nonprofit society of recovering addicts who attend meetings regularly to help support one another in recovery. NA is completely free of charge and is not affiliated with any other organizations. The 12 steps are similar to those of Alcoholics Anonymous but adapted for drug addiction. A person who simultaneously suffers from a mental or behavioral health disorder as well as an addiction to drugs or alcohol is said to have a dual diagnosis. Some treatment centers specialize in treating someone with a Xanax addiction as well as a mental health disorder. It’s extremely important to receive treatment for both conditions to maximize recovery and develop positive coping skills. If both conditions are not effectively managed, the risk of relapse is high. Cognitive behavioral therapy. Also known as CBT, this type of therapy explores connection between thoughts, feelings and behaviors. You learn coping skills to avoid using drugs. Motivational interviewing. Therapists empower you to change behavior and patterns. It helps instill motivation to recover from addiction. Motivational incentives/contingency management. These programs use positive reinforcement to encourage abstinence. Who Answers? to speak to a treatment support advisor. Detox is the process of allowing Xanax to leave your body before beginning treatment. It’s important to note that detox is not the same thing as treatment. It is the first step in the recovery process. While you are undergoing Xanax detoxification, you may experience unwanted, potentially life-threatening withdrawal symptoms—including seizures and convulsions. While it will not occur with every person, a period of closely supervised detoxification is necessary to guard against the dangers. A longer-acting drug of the same category as Xanax, Clonazepam may help to alleviate or prevent withdrawal symptoms. Clonazepam’s effects are felt more gradually and have a slower onset. This is another long-acting sedating medication that can be substituted for Xanax during detoxification if risk of seizure is high. These non-barbiturate, non-benzodiazepine medications may treat Xanax withdrawal symptoms such as anxiety, tremors and seizure after use is stopped. Aftercare is any form of care you receive after completing a substance abuse program. Recovery is an ongoing process, and aftercare offers healthy coping mechanisms and the opportunity to develop and expand on the skills you learned in treatment. Aftercare has no set time period. Many people feel comfortable attending various aftercare programs for the rest of their lives. 12-step programs. Many people find the support of these programs helpful after they complete a rehab program. Group counseling. 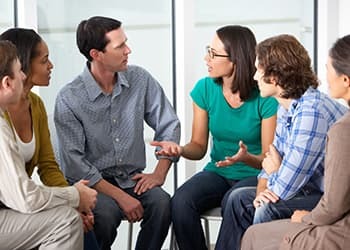 Some people choose to attend group therapy on an outpatient basis to keep working on their coping and relapse prevention skills in recovery. Individual therapy. Another option is to meet 1-on-1 with a therapist or addiction counselor to get support and prevent relapse. Sober living. Sober living homes or halfway houses offer people an opportunity to live with others in recovery post-rehab and be in a substance-free environment. Aftercare is crucial in the recovery process because you must create new habits and behaviors focused on a drug-free lifestyle. Relapse prevention measures are strengthened by participation in some form of aftercare program. Without aftercare, you are more likely to relapse as you face everyday stressors with little guidance. With teen Xanax abuse on the rise, it’s important to recognize which behaviors characterize a teen Xanax addiction to get help as soon as possible. Xanax abuse at a young age can cause increase the chance of addiction and dependence later in life, as well as increase the chance for polydrug addiction. Somnolence, or excessive daytime drowsiness. Inpatient and outpatient programs. These programs can be tailored to teens. Inpatient programs may allow teens to continue to do schoolwork while in treatment and may even offer tutoring. Outpatient programs allow teens to continue to live at home and go to school or work while in recovery. Multidimensional family therapy. This therapy involves teens suffering from drug addictions as well as their families. It addresses potential family influences on drug use and improves family functioning as a unit. Xanax is the brand name for a drug called alprazolam that is commonly used to treat panic disorder as well as anxiety disorders like generalized anxiety disorder and social anxiety disorder. Xanax changes the way that the gamma-aminobutyric acid, or GABA, receptor interacts with chemicals in your brain. The FDA has approved this drug, but it can still be habit-forming. Most importantly, it is especially addictive when used improperly. With more and more anti-anxiety medications being prescribed, the number of people who become addicted to these medications has risen. Recovery from Xanax abuse is possible. Whether you’re looking for treatment for yourself or a loved one, a treatment support representative can help. Call 1-888-319-2606 Who Answers? today.
. Aletraris, L., Paino, M., Edmond, M., Roman, P., & Bride, B. (2014). The Use of Art and Music Therapy in Substance Abuse Treatment Programs. J Addict Nurs. 25(4): 190-196.